"There are no simple solutions here. And shock therapy with massive immediate changes is not the way to go.” Economist Trevor Tombe on our immediate challenges. 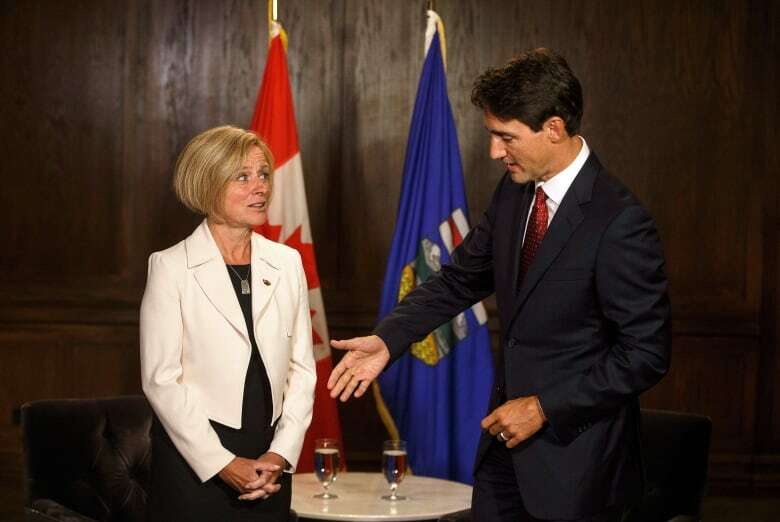 Alberta's economy is facing a "crisis," according to Premier Rachel Notley. Pipeline constraints and lower oil prices are hurting our energy sector and our provincial budget. As Notley says, it's a "real and present danger to the Canadian economy." When Prime Minister Justin Trudeau visits Calgary later this week — ground zero of Canada's fiscal and economic challenges — he will hear this message. Today, federal Finance Minister Bill Morneau delivers the fall fiscal update. It's an update about where we are as a nation — but Alberta is a big part of that story. After all, the immediate challenges are here. The price for Alberta conventional oil fell from $70 per barrel in July to barely over $20 recently. And the oilsands benchmark fell from $50 to $15. 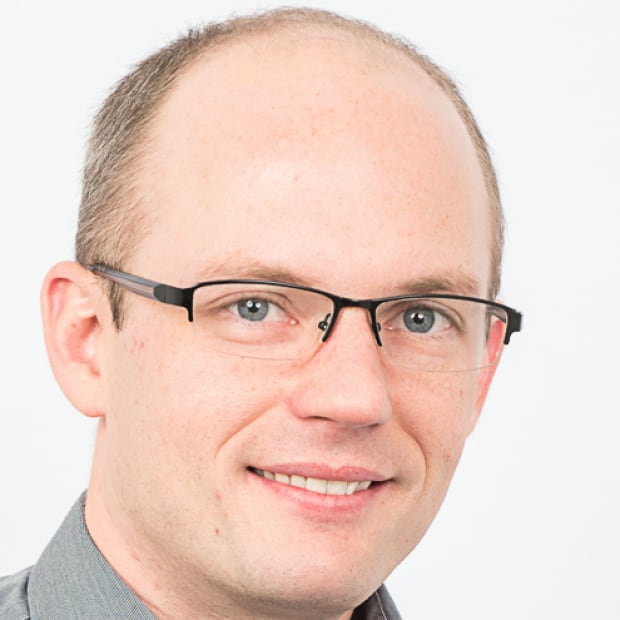 University of Alberta economist Andrew Leach tweeted a stark illustration of the drop. While the province is undergoing gradual economic recovery, these recent drops could derail that. While all this is going on, we're also facing a slow-moving financial time bomb unless we take relatively immediate action. The time for debating the problems has passed. We should accept what we cannot change and focus on solutions. And that means less spending, new taxes, or a better mix of both. Historically, Alberta depended on high oil and gas prices to balance its budget. For all the talk of diversification and change, Alberta is still betting its financial future on unstable oil and gas royalties. The government's "Path to Balance" hopes to balance the books by 2023. But it depends on rising resource revenues to do so. This just won't work. It's not a solution. It's a hope. The plan was tenuous when it was released, but now — given the growing oil price discounts and pipeline delays both in Canada and the United States — it's completely off the rails. 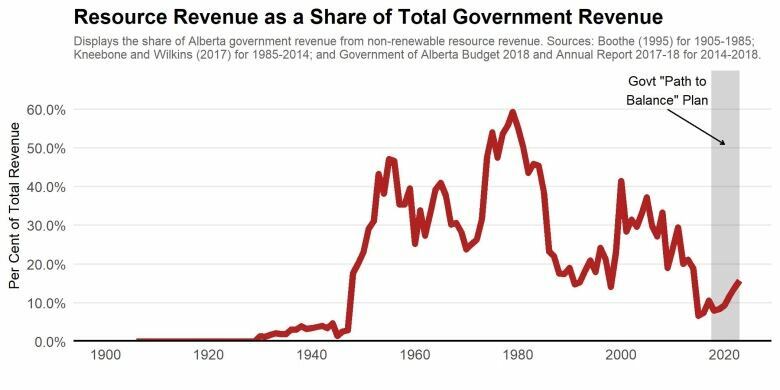 My more conservative projection, made in a recent examination of Alberta's fiscal future for the University of Calgary's School of Public Policy, suggests resource revenues are unlikely to fund any more than what we saw between the mid-'80s and early '90s. If it does, we'd be lucky. And we shouldn't bet the bank on dreams. I find current policy is pointing us toward deficits on the order of $40 billion by 2040. And that's just for that one year. Borrowing to cover all the deficits alone leads to debt levels beyond any point in Alberta's history (yes, even the Great Depression), with the resulting interest costs consuming one in six dollars raised by government. In short, Alberta's finances are not sustainable. We can endlessly debate the problems, but we need — right now — to come up with proper solutions. The bad news is that there are only difficult choices ahead for Albertans. The goods news is that there are many different options. We must pick some. And stick with them. Balancing the books within the term of the next government — whichever party that may be — is entirely credible. But as we move deeper into the 2020s, the fiscal challenge grows larger. Currently, Alberta's debt levels are set to balloon to unmanageable levels. To avoid this, revenue must rise and/or spending must fall. A lot. For perspective, the required action is the equivalent of introducing a 10 per cent sales tax or cutting one in every six dollars spent by government. Implementing either of these options immediately would be unwise, politically and economically. There are no simple solutions here. And shock therapy with massive immediate changes is not the way to go. Rather, Alberta must consider more gradual approaches. Spending restraint — even aggressive restraint — is not enough on its own. Consider if we restricted spending to rise only with inflation and population growth. This in itself is a tall order, but would solve only about half the long-run challenge. And so, we must slow the growth rate of government spending (especially in health), and introduce modest new taxes. Yes, I'm talking about a sales tax. 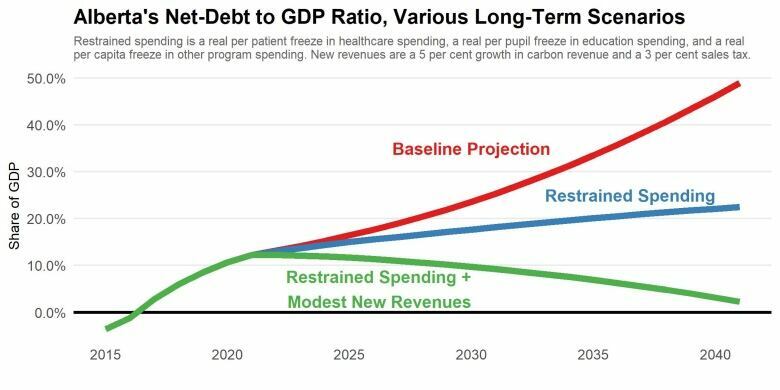 At the same time, instead of either cancelling the carbon tax, as the opposition proposes, or spending its proceeds, as the government is, we could put the revenue toward the deficit. Of course, other options are available. We could and perhaps should seek higher federal transfers — something other provinces would echo. And we should conduct a detailed review of our health-care spending and cut what can be cut. Most if not all of the above will cause anger, resentment and pain. But the time has come to have an honest conversation about where our money comes from today, where it will come from tomorrow, and how best it should be spent. There are many paths forward. All involve trade-offs. To ensure we make the best decisions possible, long-term planning is necessary. 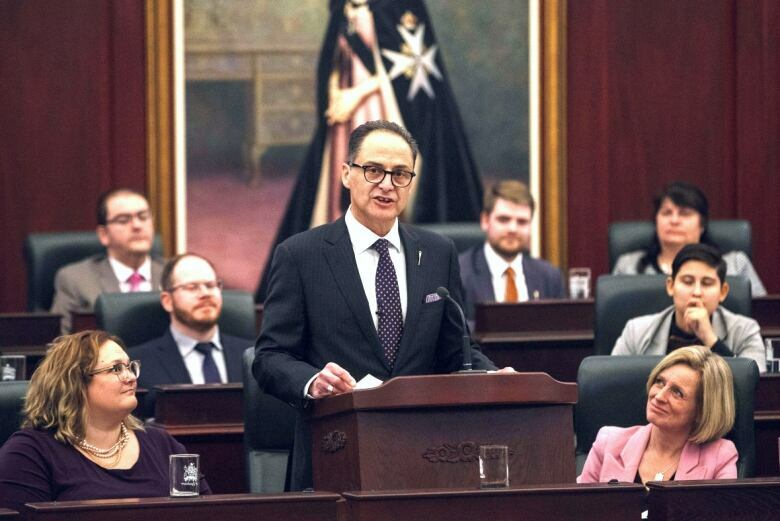 To quote the former Auditor General Merwan Saber's final report: "considering the impact of today's decisions on future generations of Albertans is not just important but without question the right thing to do." He goes on to note that "risks and opportunities are likely to be missed in absence of putting pen to paper and projecting a fiscal path." So let's put pen to paper. Let's recognize and prepare for the long-run challenges ahead. Government — any government — should lead the way with regular analysis and clear, consistent goals. Forecasts shouldn't be aspirational, but rather be an honest, hard headed reflection of our fiscal reality. In turn, we Albertans must understand challenges ahead, be open to them, and be aware that at this point only painful options are available. We did little long-term planning when times were good. We did little when times were bad. It's time we do something different.